We had a wonderful first session. I was so pleased with how open and eager you were to explore these new skills. 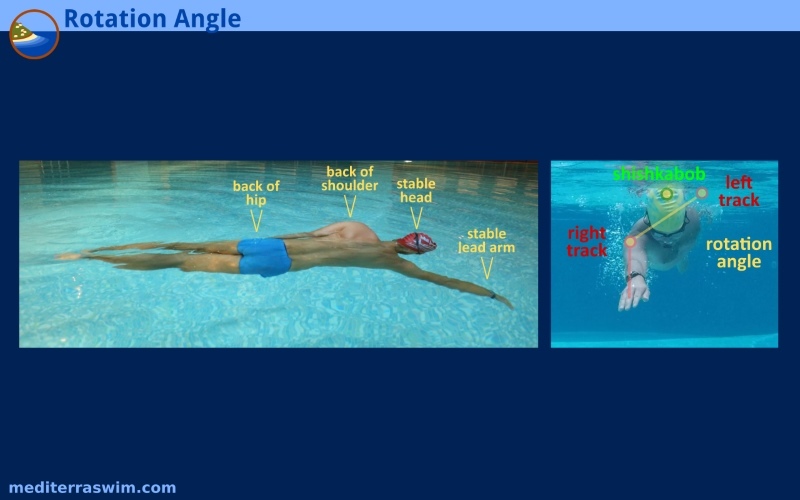 Our objective is to bring you to a place where you can feel comfortable and confident in the pool, in shallow water and deep, and feel ready to begin to peacefully work on regular stroke technique. Specifically, we want you to have a skill program ready for self-rescue if you were to fall into the water and needed to bring yourself back to the wall without much trauma. The path between ‘standing secure and dry, on the deck’ to ‘swimming secure and freely’ will have you acquiring many foundation skills to make swimming feel and look as wonderful as you see others enjoying. 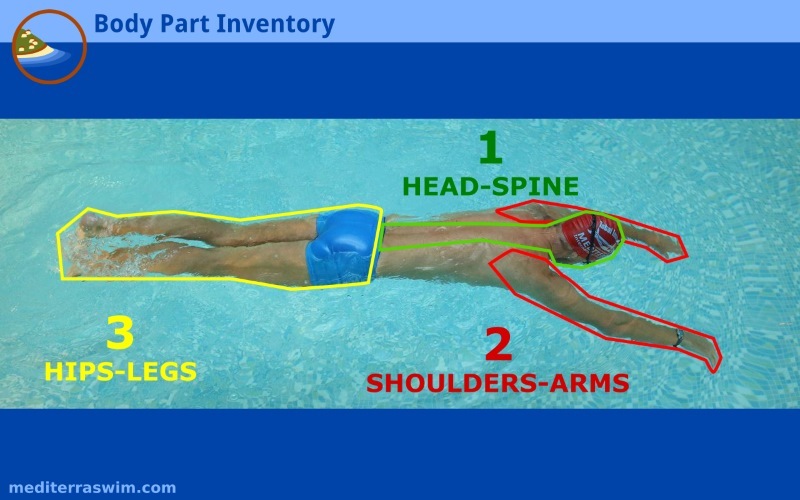 This course is meant to break those foundation skills down into small, bite-size pieces and have you gently work on each one at your own pace, and gradually combine those skills to take you into swimming position and peace. In our first lesson we worked on moving into this ‘Superman Glide’ position (pictured below), isolating each micro-skill involved and building them one-by-one. Without going into too much detail (yet), I demonstrated this Superman Glide position to you and explained the physics and physiology of how this works. By lengthening the body, holding it firm in the middle, loose at the appendages, and letting the head rest ‘weightless’ – fully supported by the water, as if laying on a massage table – the water can more easily support the body in this neutral corridor parallel and just below the surface. Remember: the peaceful place is just below the surface. We want to position the body inside this corridor and protect its position there. Anytime a body part rises above or below this corridor there will be some negative effects on our balance and stability. Recall how lifting the head will sink the hips and legs. The brain detects sinking and when it does, it raises the mobilization (defensive/survival) response in the body, which you experience as stressful. You turn off this response by positioning your body parallel, in that neutral position where there is no sinking and no struggle against gravity. Obviously, this involves holding breath so that the head can be submerged into its neutral position. For this we practiced gentle bubbling from the nose, and then a technique to extend breath hold, by first holding the breath and then at first urge to lift the head you instead start bubbling gently through the nose to relieve some carbondioxide in the blood stream which calms that urge down for several more seconds, easily extending your comfortable time underwater. We began these activities with my hands keeping contact with your hand or arm. Gradually, we worked toward you feeling comfortable being independent of that touch. I want to point out that one of the key features of this training is not just what skills your body is learning, but what skills your mind is learning too. You are training your attention. By occupying your mind with paying attention to things you can control you are making it more difficult for the brain to pay attention to things it cannot control – which tend to bring about negative sensations. By intentionally holding attention on signals coming from your body and your body interacting with water, and by sending specific commands to parts of your body to improve what you feel and do, you are keeping attention on things that are positive and productive. This is the central to the technique for building not only safety and peace in the water, but greater enjoyment of practice. So, spending your time in the pool focused on specific skills and improving sensations will not only improve your skills more rapidly, it will make time disappear and magnify your enjoyment of your body in water. We had another good session, moving steadily forward with skills and comfort. First, you reviewed your skills for lengthening the body, holding the lane line. You safely explored the sensations that come from the body when it detects different levels and ratio of CO2 and O2 in the blood stream, in these three different conditions. The warning signals that previously forced you to lift your head out of the water were set far away from the actual danger zone of breath hold. In this exercise, you started to resist those initial urges, apply a technique for relieving the urges, while you explore a few steps past that originally, over-cautious ‘danger’ line. You were able to see that you can comfortably spend a lot more time underwater than before, and that you could reinterpret those warning signals, setting your ‘danger’ line farther back. When you feel comfortable holding breath longer, this gives you more time to get back into a cooperative position with the water, and to let you mind pay attention to other things when practicing or in a safety situation. We went back to lengthening the body on the water. I explained how we want to position the body in that ‘neutral corridor’, that zone just below and parallel to the surface of the water, where the body can rest between gravity pushing down and water pressure pushing up. Any time we push a part of the body above that zone, or push below it, we start to work against those forces. In the previous lesson notes, I included a picture of me in the lengthened body position that you’ve been working on. In Total Immersion we call this Superman Position. So, I will refer to it like that from now on. You learned to trust the support of the water completely. In addition, you pushed off the bottom to give yourself some forward momentum. And, then I had you add a gentle flutter kick (slight flex of the knee, with a flutter from the flexing ankles) to feel what its like to add some propulsion with your legs. Once while we were working in Superman, your body accidentally tilted/rolled to the side and this causes a little disruption to you for a moment. It is certain that when exercising or playing in the water with your kids, your body will move around into many different positions, so the brain needs to gain confidence that you can still stabilize yourself no matter what position it finds itself in. So we practiced standing back up from a tilted position, from each side. I had you lay in Superman while I rolled you a bit to one side, then you practiced tucking the knees and standing up. Then I had you practice being put into a tilted position then just waiting for the water to bring you back to level in a couple seconds. Then I had you practice being pushed below the surface 6-12 inches then feel how the water immediately pushes you back to the surface. Somewhere in the lesson I explained the mental technique we employ to reduce the influence of fear while in anxious situations – we want to develop a habit of keeping our attention on things that are positive and productive. We want to keep our attention on things we can control so that we are not overwhelmed by the things we cannot control. By using focal points we can keep attention on parts of the body and our reactions and responses in order to correct and protect things that keep us going in a good direction. This fills up the channels of attention so that fear doesn’t have room to take over. This is the recipe for both dealing with dangerous/frightening situation as well as just making practice time so much more enjoyable. You may read more about this in How To Occupy My Attention. You did so well today! We really made some big progress in your skills. You explored the float-on-your-back position, gradually coming to relax and trust the water to support you. Then you practiced transitioning from this float on back position to standing up. With your skill for standing from face-down and now this skill for standing from face-up position, and some practice from any twisted position between, you are in range of being able to stabilize and stand up from any irregular position in the water. 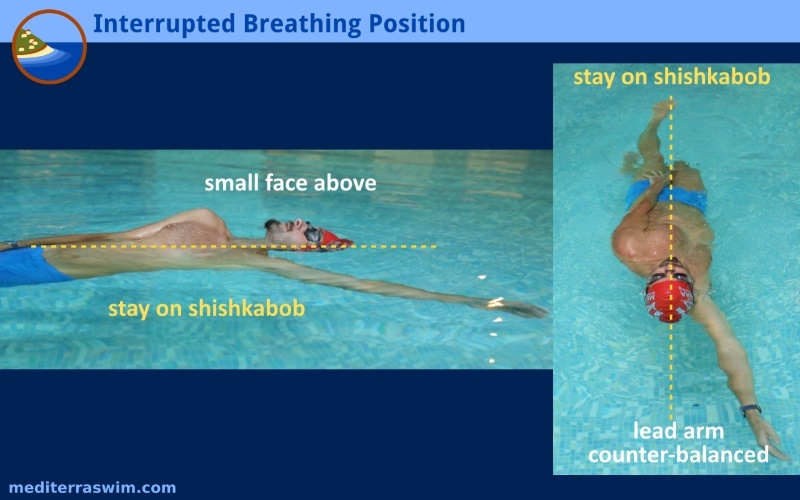 You started with a legs and arms spread position, and then you gradually reshaped it into what we call the Interrupted Breathing position, which you then used to roll back to face down position in the water. From this position, with one arm extended above and the other at your side, you could practice rolling toward that lead arm and into your face-down position. In the notes of our previous sessions you see a picture of Superman Position. That is your face-down resting position. But for turning back toward air, you need to tuck one arm to your side – again, like preparing to roll a victim in CPR. We call this Skate Position. Don’t worry about the other technical notes in this image. Just notice the one arm tucked at the side, and the other arm extending in front. Lastly, you practiced a common scenario, sitting on the edge and then sliding into the water. You started in the 3’6″ deep part and gradually worked your way down to the 5′ depth. You let go of the side. You didn’t need me to assist. You gradually moved to deeper water. You eventually were able to forgo the immediate rise to breathe and just lay calmly in Superman a bit longer – which, in a safety situation, would allow you time to think about where you wanted to go next in a more calm, deliberate manner. From that position you could roll to breathe or flutter kick in the direction of a wall or lane line or another person. With practice to help you feel more and more calm in this scenario, you are freed up to play in the water and to rescue yourself from a low-level fall into the water.